Local Trust - How can residents and public services work together? Our experience of Big Local shows there is great variety in relationships between communities and public services, including local authorities. We’ve seen that care and work is needed to develop effective relationships, and that collaboration can be valuable for all. This has been supported by our survey findings: local authorities and residents both think that working together is really valuable, and they want to do more. The survey shows there are challenges to working together, including both sides having different expectations about collaboration. However, the survey also found that having the opportunity to discuss solutions together - and open-mindedness from everyone - helps to overcome barriers. Get one or two specific individuals from the council involved with the Big Local partnership as an observer and advisor so they can see what is happening. Speak with lead officers and find out their priorities, meet the same people every few months – what does the council need to get done, what problems do they face, are there things which both the Big Local partnership and public agencies want? 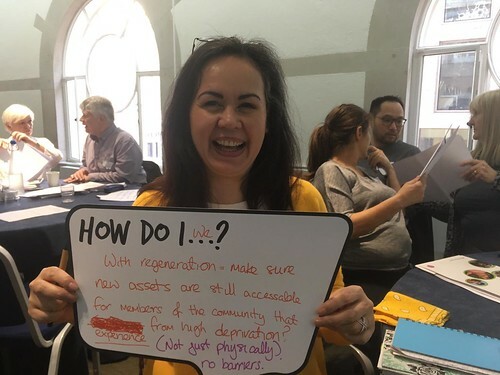 Talk about what Big Local could do – perhaps help deliver a service with volunteers, if the council provided equipment, training and space, maybe there are bigger deals to work towards longer term? A resident in St Peter’s and the Moors is a member of the Big Local partnership and works at the University of Gloucestershire so created activities with the local primary school and university. As a result, the people of the area and the educational institutions recognise they are assets to each other. The school organised a competition to design the area’s Big Local logo and the university adopted Big Local into four of its course modules: landscape architecture, geography, youth work and sociology. Read more. In Barrowcliff the Big Local partnership worked with Scarborough Borough Council, Yorkshire Coast Homes, the North Yorkshire Police and Crime Commissioner’s Community Fund and Groundwork North Yorkshire to develop and refurbish a play park, with Scarborough TV news recording the project. The park was prioritised by people locally, designed by them (including children) and enjoyed by them. Read more. Woodlands Big Local is running the local library. This includes all the usual services, along with delivering careers and employment support through a worker. The Big Local partnership became a constituted group and leased the building on good terms from the local authority. The local authority supported the partnership to recruit and train volunteers, supplied them with a librarian to support with stock, and agreed to take responsibility for external and major repairs as well as the running cost of the building. Read more. L30s Million put on a firework display in November as a way to develop community spirit in St Oswald and Netherton, because lots of people said how disappointed they were that the firework displays stopped when funding was cut. The display takes place at the Netherton Activity Centre, owned by the council. Read more on the L30 Facebook page or the council's website. Three Parishes Big Local partnership were involved in establishing a car sharing scheme with Shropshire Council, as a way to improve travelling to some of the large employment areas. This was set up because people find the bus fares expensive, and whilst reliable and regular, the bus services aren’t frequent and don’t run in the evenings. Three Parishes Big Local are also actively negotiating with Shropshire’s rural community council about a local ‘Wheels to Work’ scheme for young people and are interested in finding out whether a Saturday evening minibus service to Chester or Shrewsbury might be feasible. Read more. To learn more about the benefits and challenges of public services and residents working together, we hosted a roundtable discussion at the Royal Society of Arts. There were attendees from public services and academics, as well as people involved in Big Local. View the discussion summary (includes recommendations for successful collaboration).